As well as adding products and services to your opportunity, you can also add text items. A text item can be whatever you like: it’s not linked to your Resources – it’s great for ad-hoc or bespoke items. Text items are marked with a small T in the opportunity items list. To add a text item, click add new opportunity item/group and choose item at the bottom right of the items list. Choose the “Text Item” radio button at the top. In the name field, enter the name you’d like to give your text item. Unlike when adding a product or service, this doesn’t auto-suggest from your Resources. After this, fill in the fields as normal. Is this a rental, sale, or service? 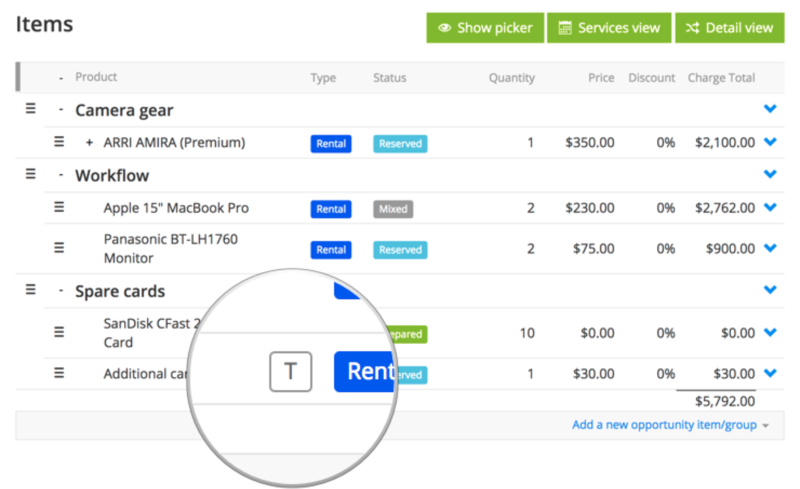 Change the transaction type here to specify whether you are renting or selling a product, or supplying a service. Quantity to add to the opportunity. Add a description. This will show up underneath the product in the order view in Current RMS and shows up on most of our quotation layouts. Apply a percentage discount to this line item here. Choose the tax class for your text item, if different from the option selected. Select a revenue group for posting to a linked accounting solution. From here, you can also specify that the text item is a sub-rental or sub-contract service. If you’re working on a provisional quotation, reserved quotation, or an order, new fields will appear. Pop in the name of an organization in People & Organizations in the supplier box, if known. Specify costs for the sub-rental. If you’ve enabled chargeable days on the opportunity, use the chargeable days field here to override the days to charge for this particular line item. If rental, choose the rate definition you’d like to apply to this text item. This will be used with the price to calculate the rental charge. What's the value or how much does it cost to replace this item? Enter the price you’re charging for the text item. For rentals, you’ll see the rate period listed after the price. By default, Current will set the start & end date of this service to the opportunity start and end dates. Change these as you wish by clicking in the start & end date boxes. The rate type and price will default to the first rate assigned to the service with a price in the order day, hour, distance, and flat rate. To change, choose another option in the drop-down menu. When this slider is set to YES, Current will create a line on the opportunity for each day of the service if it spans multiple days. This gives you the flexibility to break down charging by day on your quotations & invoices, as well as letting you allocate different people or vehicles for different days. 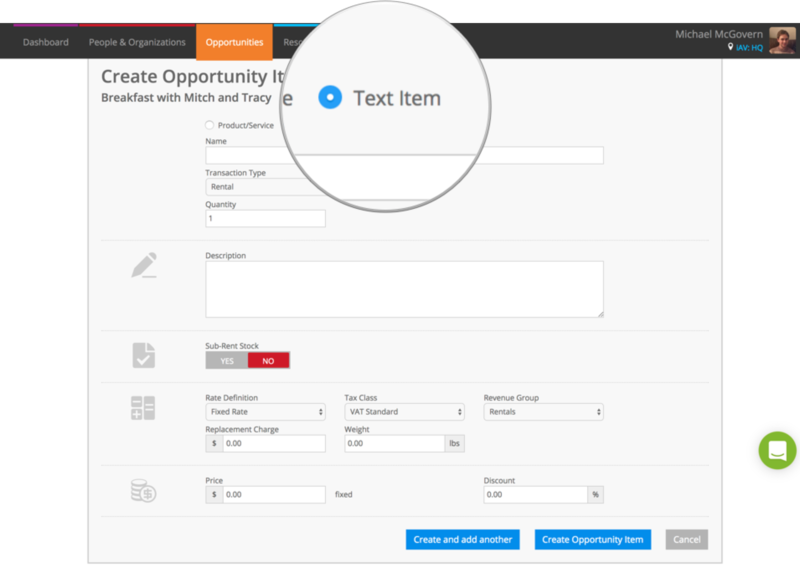 Click Create opportunity item to add the product or service you have configured or Create and add another to return to the same screen to add more products. Can I allocate assets or resources to a text item? No. Text items act like non-stock products or services where availability isn't tracked. My text item isn't showing on my document layout, why is this? Each of our document layouts displays data slightly differently, giving you the flexibility to quote in a variety of ways. By default, text items are added at the bottom of an opportunity outside of an opportunity group. Some of our layouts are set to hide items that aren't in an opportunity group, so this might be why your text item isn't showing up. To fix this, simply drag your text item into an opportunity group using the handle to the left of it.